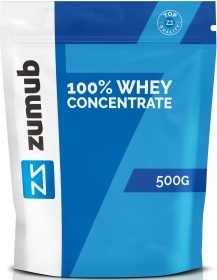 Zumub 100% Whey Concentrate is a premium protein powder featuring a killer combination of benefits - the supplement provides the inherent goodness of whey concentrate, is of superior quality and can be obtained at an unbeatably competitive price. Whey Protein Concentrate is the most widely used and most studied type of whey protein, which is used to promote muscle growth and recovery, being a very popular choice among bodybuilders. Why choose whey protein concentrate? ●	Highly bioavailable. Unlike most of its counterparts, whey can boast exceptional bioavailability and is easily absorbed. ●	A complete protein - offers a full spectrum of essential amino acids, those that our body can’t produce for itself and that need to be obtained through diet or supplements, such as Zumub 100% Whey Concentrate. ●	Rich in bioactive compounds, which ensure more quality and extra support. ●	Lean muscle mass growth. As soon as our protein enters in your body, myriads of muscle building blocks outrush to do their job - muscle growth support. ●	Muscle recovery. By giving your muscles what they consist of, you can prevent protein depletion letting your muscle tissue replenish its energy stores without the unwanted protein breakdown. Why Zumub 100% Whey Concentrate and not any other protein booster? ●	Delicious and safe flavours - choose among vanilla, strawberry or chocolate. ●	Unbeatable price - the best option if you want quality protein without breaking the wallet. ●	Manufactured from sweet dairy whey using micro filtration and ultra filtration. 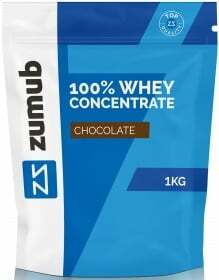 If you are still in two minds about buying Zumub 100% Whey Concentrate, don’t hesitate to put it to cart, for if you are not completely satisfied, we will refund everything you paid and another 10%. It’s not about generosity - it’s about being sure in what we offer our customers. Have a question about 100% Whey Concentrate? What is it, what does it do, how and when to use or something else? Ask us. Nutritional facts and ingredients for Chocolate flavor, vary slightly for other flavours. ALLERGEN INFORMATION: Contains Milk ingredients.,May contain allergens handled in the production facilities, such as other cereals containing gluten, milk, lactose, soy or nuts. ALLERGEN INFORMATION: Contains Milk.,May contain allergens handled in the production facilities, such as cereals containing gluten, milk, lactose, soy, nuts, sulphites, peanuts or sesame seeds. WARNINGS 100% Whey Concentrate : Do not exceed recommended dosage. Keep out of reach of children. This product should not be used as a substitute for a varied and balanced diet & healthy lifestyle. This product should not be used in case of hypersensitivity or allergy to any of its constituents. Store in a cool, dry place. Please Recycle. BEST BEFORE: Please see lot number and expiration date stamped on the packaging.